Do you remember the Queen Mother of RVs that Unicat made? I think we have just met her king, and it's one of the oddest and ingenious motorhomes we have seen for a while. 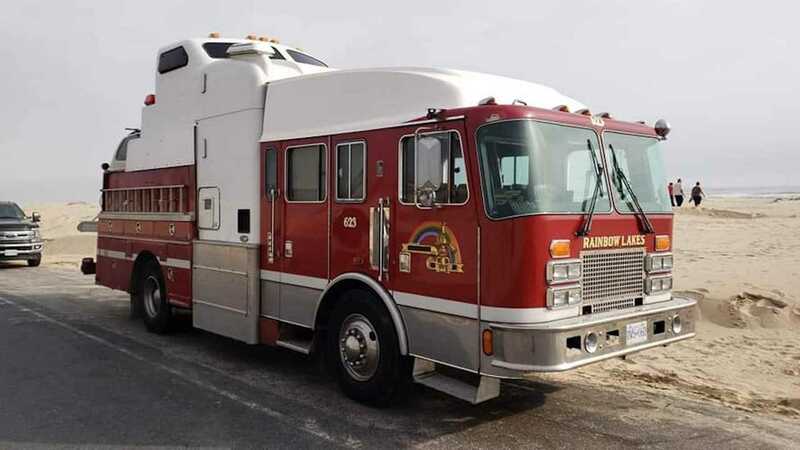 The RV that we're talking about is this – a mishmash of a firetruck, Peterbilt and Kenworth semis, and a wrecker, spotted on its way to South Padre Island. According to a Texan TV station ABC South Texas, which found the vehicle's manufacturer and driver, the firetruck motorhome is owned by a guy that goes by the name Brian Portman. He's a former boat builder and the big red RV isn't the first he made from the remnants of a firetruck. "My first one, after ten years of building it, three years of use, burnt down," Portman told ABC. Oh, the irony. However, despite the fiery demise of his first firetruck-based RV, it didn't stop Portman to build his second model with the same specifications. The engine of his second model is 25 years old and cost him less than £10,000. To expand the body, Portman used a Peterbilt semi with a Kenworth roof. The rear end, on the other hand, was from a wrecker. The midsection of the firetruck RV has a Volvo roof on it for that elevated cabin where the passengers could stand. So you like custom RVs? Inside, there is a pair of bunk beds, a refrigerator, and a small stove for warming the RV's interior. The cooking stove is found at the side of the vehicle. Doug Poggensee spotted the working and running firetruck RV on his way to South Padre Island. He then shared his photos on a Facebook enthusiast group of vintage fire engines. Meanwhile, Portman drove all the way from Vancouver, Canada with his creation, which is a total of 2,570 miles of driving.